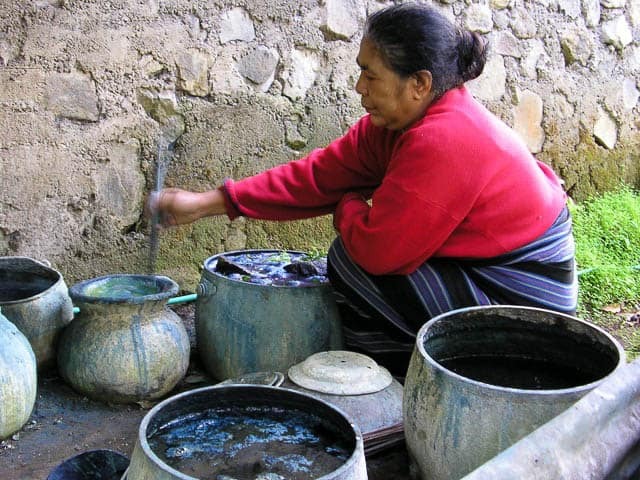 Katharina Paba is a natural indigo dyer and weaver from Bajawa on the island of Flores. In the 1990s, she had a series of dreams in which she was told to make a lawo butu beaded textile with an ancestral ship on a field of elephants. She made the textile, and placed it on consignment with an antique dealer in the town of Ende. Within a few months she fell ill, and for years she went to modern and traditional doctors without success, until a medium told her that her ancestors needed the textile she had made. After a hurried trip to Ende to recover the textile, Katharina’s whole clan had to perform an elaborate ceremony to install the textile among the sacred relics in the clan house. Within a few days of the ritual, Katharina recovered completely. For many years after that, she made a living selling lawo butu textiles to outside buyers and local communities. Bajawa has a matrilineal society, and the senior woman at a ceremony for the completion of a new clan house or ancestral shrine must wear the lawo butu from the clan relics. Though there are many weavers in Bajawa, few are recognized as having been chosen by the ancestors to make these powerful ritual textiles. Threads of Life is a fairtrade gallery based in Ubud, Bali, that works directly with over a thousand weavers on eleven islands across Indonesia, helping them to form weavers’ cooperatives, maintain their traditions, expand livelihood opportunities, and conserve the forests from which natural dye resources are harvested. Katharina was one of Threads of Life’s first partners when it was started in 1997. When Threads of Life buys a textile from Katharina, she does a ceremony in her clan house. After she has made the appropriate offerings, she spins a coconut to determine the will of the ancestors: can she sell this textile? Whichever way the coconut points when it stops, Katharina says, “They say yes.” It is unclear how the coconut would say no, but her point is to give the ancestors the opportunity to say no, and in so doing to acknowledge the way of life handed down by the ancestors. Indonesia’s traditional textiles are beautiful works of art, but they are also a principal material expression of intangible culture. In their uses as traditional dress, offerings in animistic and totemic rituals, ceremonial gifts at weddings and funerals, and shrouds to identify the deceased to their ancestors, textiles symbolise a community’s social institutions and customary law that are collectively known as adat. In their motifs and designs, traditional textiles carry the knowledge, values, aspirations and meanings of intangible culture, and have been described as the “skin of adat”. Five hundred kilometres east of Bali, in the province of Nusa Tenggara Timur where Katharina lives, the poverty line is just seventy cents per day, and twenty-five percent of people live on less than this. In the 1980s the provincial government started teaching weavers to make their designs and motifs simpler and larger, in order to access a mass market. In her village on the island of Timor, Rosa Bubu organized a cooperative to do this work, but the promised mass market did not materialize. There was just the local market they already sold to. They were still making just seventy cents per day, but now without any cultural integrity. They soon abandoned this work, and the co-op was dormant until 2004 when Threads of Life was introduced to them. Using natural dyes and traditional patterns, the weavers now make at least three dollars per day. When development is defined as the eradicating of poverty, intangible culture gets sidelined. This does two things: because this poverty is elsewhere, we in the developed world are absolved of the need to develop ourselves; and because culture is disregarded we allow ourselves to ignore the potentially very different value systems and aspirations of the people we set out to help. 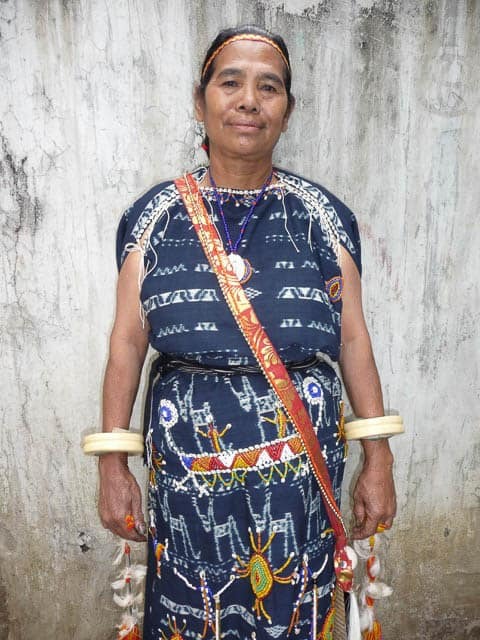 The women Threads of Life works with are united by a pair of questions that the organisation’s field staff hear over and over: “We are told we are backwards and primitive because we want to keep our traditions and way of life. We are told that we must choose between keeping these traditions and joining modern society and the global economy. Why must this be an either-or choice between tradition and development? How do we express our culture and identity and make a living while doing so?” Threads of Life’s work is an ongoing exploration of how to answer these questions in a way that benefits us all. 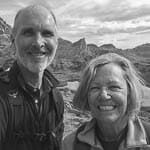 William Ingram and Jean Howe are the founders of Threads of Life in Bali, Indonesia. They started Threads of Life in 1998 when travelling to Lembata during the economic crisis where they saw heirloom textiles being sold and while we understood the need; pay for children’s’ education off island, they also asked: “what’s replacing these old pieces?” The answer was that they could not afford to take the time required to make the textiles using the complex dye techniques required. They commissioned 12 women to make a piece each. They now work with more than a 1000 women on 11 islands in the archipelago. The Indonesian team that works with these women are dedicated and passionate about supporting the continuation of these important cultural objects still required for ceremonial use. Threads of Life has a gallery in Ubud where textiles may be purchased and also offers classes for appreciation and a better understanding of textiles. They have a dye studio and dye garden as well where they offer batik classes as well as week long study programs in natural dye, batik and weaving. I commend your work. You have added great value to Indonesian culture. Three years ago I visited Threads of Life, and took a textile tour of Bali offered by the gallery. I also have a textile I purchased on show in my living room. My other textile is a double ikat from an earlier visit to Tenganan. My interest in Indonesian textiles began when I became a volunteer guide at the National Gallery of Australia. I have learned much about textiles due to the Gallery’s fine collection, and am proud to be able to focus on textiles during some tours. If the volcano does not interfere, I will be again in Bali in early November. Threads of Life will certainly be on my visit calendar.